This guide has been created to show you how to use the StreamAlot website to its full potential. Use the navigation on your left hand to find your way around this manual. If you have trouble finding the information you're looking, you could try searching this page (ctrl/command + F). If you still have any questions after reading this page, please contact us. The StreamAlot website allows you to view your personal information, manage your locations, and control exactly which music channel should play at each of your locations, at any given time. This is achieved thanks to a powerful calendar functionality, included in the website, which allows you to schedule, on a weekly basis, any channel at any time of any day of the week. By default, there is one general calendar that will control all the locations, but it is also possible to create individual calendars for each location, if necessary. To access the StreamAlot website, point your internet browser to http://www.streamalot.eu. The introduction page will appear, where you can browse information about Streamalot, read the frequently asked questions or login to your client account, using the login link in the top right. Once you’ve logged in, the StreamAlot toolbar will contain four buttons: My info, My locations, My channels and My calendar. The first button of the toolbar allows you to view and modify, if necessary, your personal information. To modify any field, type in the appropriate changes, then click on the [save] button. By clicking on the second button of the toolbar, you will see a list containing all your locations. Each location will have a green or red button, indicating if the location is online or offline for some reason. Each location has an edit button (pencil icon), which displays and allows to modify the contact information of that specific location. After clicking the button, a popup window will appear, containing the information. To make a modification, edit the appropriate field, and click on the [save]. If not, click on [cancel]. In any case, the popup window will disappear. 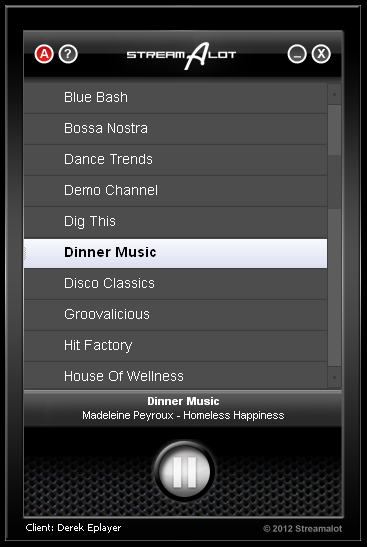 By default, all locations will play the same default channel (see next section My Channels). If you want some location to have a different default channel, click on the checkbox. 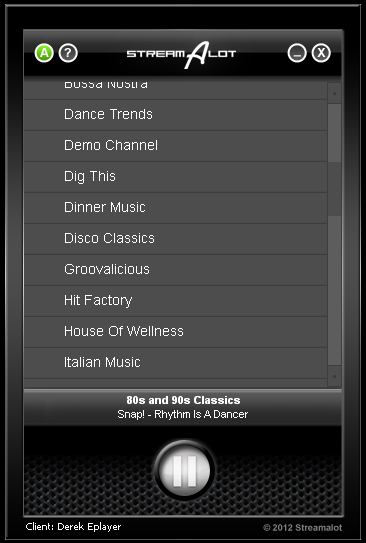 The droplist on the right will be enabled, and will allow you to set the default channel for that location. In the following screenshot, you can see how one of the locations has its own default channel (Sunset Lounge) while the other two are using the main default channel (Pop Rock Legends). By default, all locations use the general client calendar. This is indicated by the HQ (headquarters) button. But you can choose, for each location, if you want to use this general calendar, or create a special calendar. This is achieved with the [special calendar] button (showing a refresh symbol). By clicking it, the HQ button text will change to LOC, indicating that this location has its own calendar. To edit the calendar, click on the HQ or LOC button. If the text is LOC, you will be editing the location calendar, but if the button text is HQ, you will be editting the general calendar, which will affect all locations using the HQ calendar. The location calendar and the general calendar both work the same way, described below in the My Calendar section of this guide. This section of the website displays the list of channels available to you. These can be used in the music calendars of your locations. All the channels have a red buttons, except one that has a green button. The green button indicates the default channel for your locations. So, at times when nothing is scheduled in the music calendar, this is the channel that will play by default, instead of hearing silence. Changing the default channel is as easy as clicking on the red button of the desired default channel. The calendar section displays the general client calendar. The screen will display a one week calendar, which allows to schedule channels at any time of the day, any day of the week. If you have agreed with The Music Marketeers to only use the streaming platform during certain times of the day, the remaining time will have a light-blue schedule, which will make the streaming box remain silent. Such blocks cannot be edited or deleted by you. The calendar is really simple and intuitive to use. Most actions can be done by drag & drop actions on the calendar screen, or just clicking the existing elements. The actions that can be done on the calendar are the following. To create a new schedule, just click on the start time of the day you want to edit, then drag the mouse down until the end time. At all times there will be a small popup next to the mouse pointer, indicating the current time. 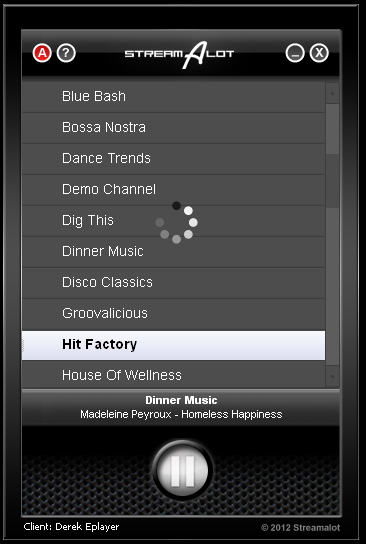 When you release the mouse, a small form will appear, allowing you to select the channel that should be played during these times. You can also use this form to fine tune the new channel schedule, indicating the start and end times with more precision, as well as the day. When the settings in this form are correct, click on the [save] button, and the new schedule will appear in the calendar. If you don’t want to save changes, click on the [cancel] button. The form will disappear, and no changes will be made to the calendar. If your new schedule overlaps with an existing schedule, the [save] button will be disabled - it’s not possible to create overlapping schedules in the agenda. If you want to make any change to an existing schedule, or maybe delete it, you just have to click on any part of the block in the calendar. A small form, similar to the schedule creation form, will appear. You can use this form to change the start and end times of the schedule, the day, or even the channel that should play. When the settings are correct, click on the [save] button, and the changes will be applied. If you want to delete the schedule, just click on the [delete] button, and the block will disappear from the calendar. If you only want to move the block around the calendar, keeping the same size, you can drag the block with your mouse, and drop it wherever you want. The same form will appear for you to fine tune the settings. With these actions you are ready to create a full calendar, controlling which channel will play at each location, at any time of the week. In order to make this even easier, there are a few shortcuts, to help you prepare your calendar quicker. Sometimes, you might need all the days to be the same in the calendar. This doesn’t mean that you have to create the same schedules for each day of the week. Instead, you can create just one day, then copy it to the whole week. To do this, first create the schedules for one full day. When its ready, click on the day name, at the top of the calendar. A small form will appear, containing the option copy day. If you click on this option, you can choose which should be the destination days. Finally, click on the copy button, and the whole day will be copied, with just three click of your mouse! The copy day option only appears when the selected day contains at least one block. If you want to listen to the same channel on a certain day of the week, there is a shortcut too. Click on the name of the day, and select the set channel option. 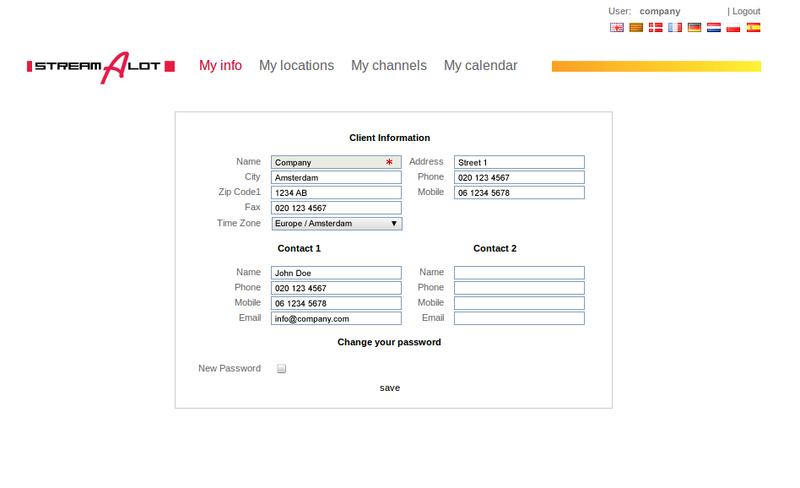 A list of your channels will appear, select the desired channel, and click on the [save] button. This option only appears when the day you click on has no previous schedules. If you want to schedule a channel during the whole day, when the day already has a few blocks, you must delete these first. If you want to clear a whole day, deleting all the existing schedules, there is a much simpler way than deleting them all one by one. Just click on the name of the day, and select the option delete all tasks of this day. Of course, this option only appears when the selected day has at least one block. 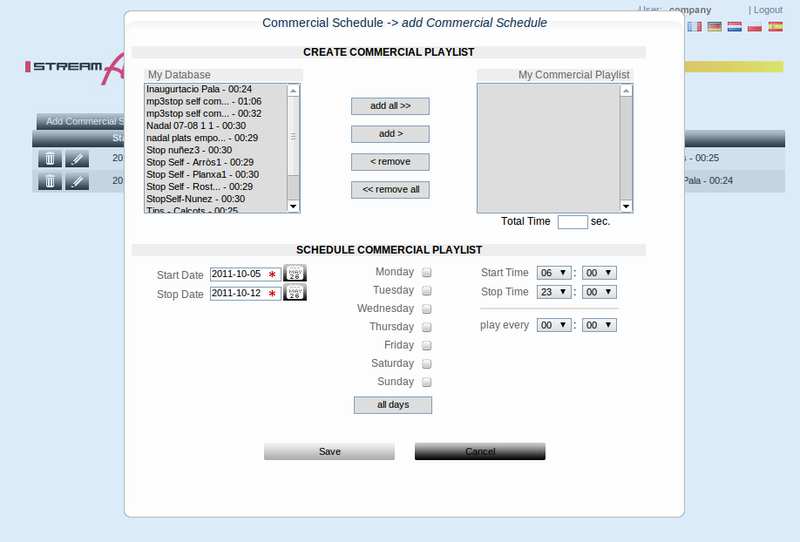 The StreamAlot website allows you to schedule commercials in your music channel. This option is only available for clients with a custom channel. If you are interested to have your own music channel created, please contact Streamalot. The process involves two steps: uploading the commercial files to the streamalot platform, and deciding when the commercial should play. Clicking on the button gives you access to the commercial uploading screen. On this screen, you can see which commercials are already uploaded, and ready to be used in that channel. This option allows you to modify the name of the commercial. Delete removes a commercial from the list. This option will automatically remove this commercial from any existing commercials schedule that contains it. 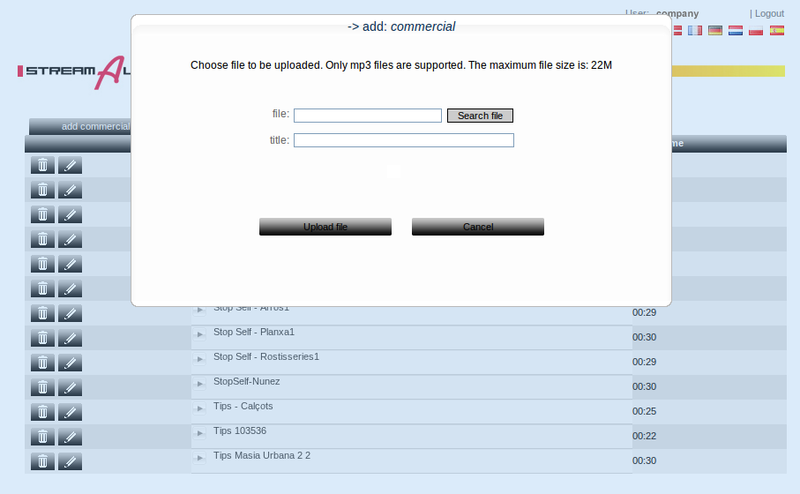 To add a new commercial file, click on the Add Commercial button. A new form will appear, where you can choose the file to upload, and the title. Only MP3 format is accepted. When ready, click on the Upload file button. The file will be uploaded, and the new commercial will be added to the list. 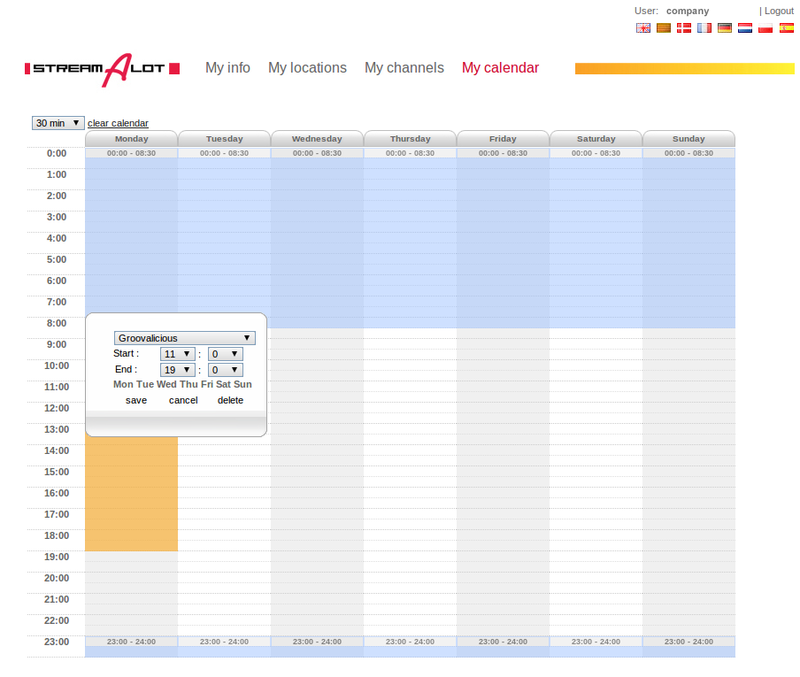 Once the channel has commercials available for scheduling, click on the button to schedule when they should play. 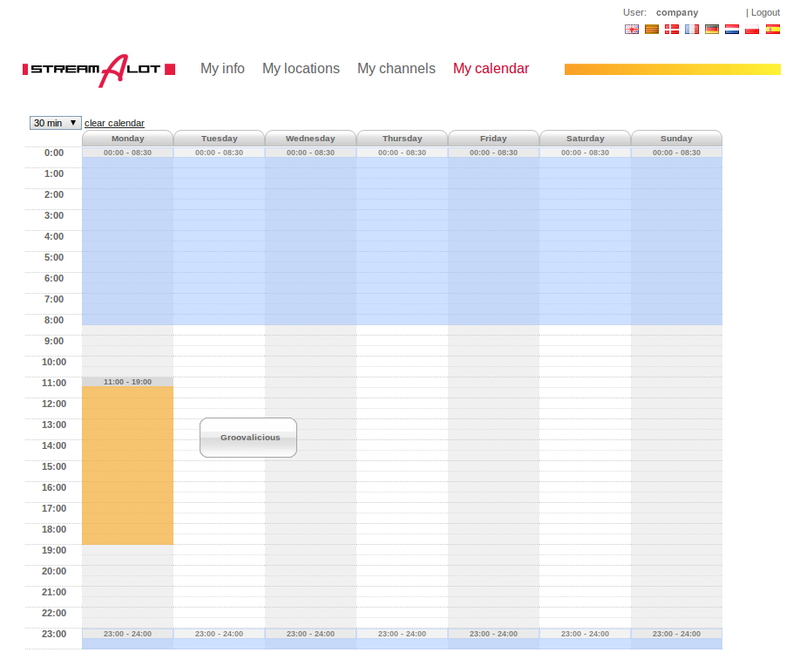 A screen will appear, showing what is already scheduled in the channel. These two dates limit the period in which the commercial schedule should be played. Indicates if the schedule should be played on each of these days. These two times indicate the period of time in which the schedule should play, each day. This value indicates how often the schedule will be repeated during the scheduled period. The total duration of the commercial schedule. This column indicates the commercials that are scheduled. To create a new schedule, click on the add commercial schedule button. 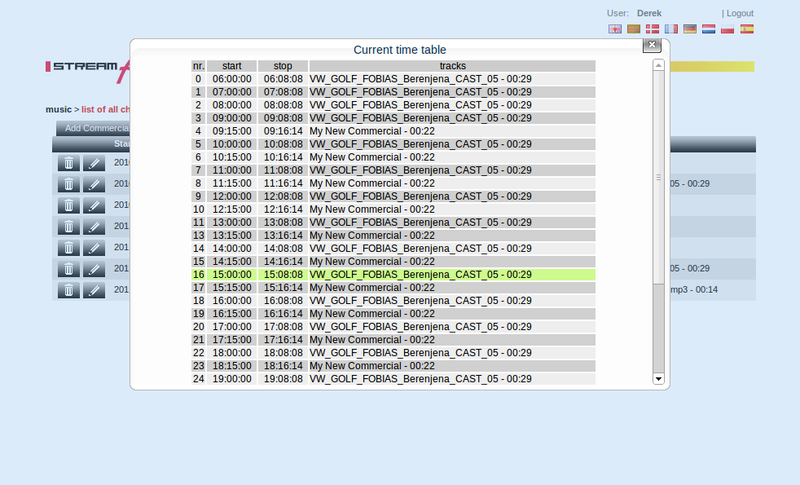 A new form will appear, where you can specify all the parameters for the new commercial schedule. 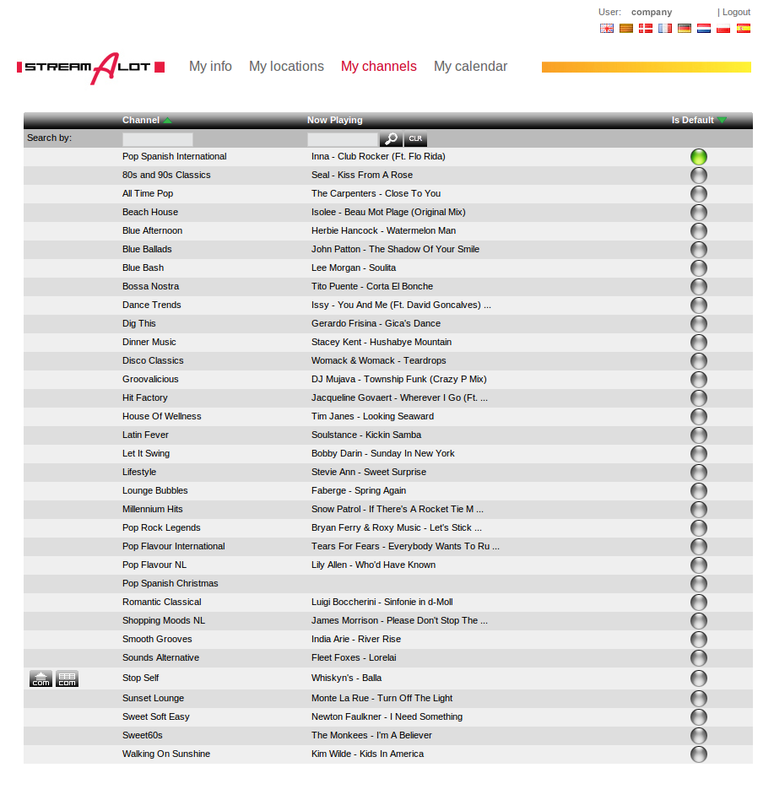 You can also preview what is going to play today, by clicking on the button preview timetable. A screen will appear, indicating the schedules for the current day, and marking the next schedule that will be played. Connecting the StreamAlot box is a walk in the park. In this short manual we will guide you through its installation process. All you need to do is follow the steps below, and you will have it up and running in no time! Our easy three step installation will have your StreamAlot up and running in no time. Connect the network connector (B) to a free port on your network switch or router. Finally, connect the power connector (C), to an electric socket. That’s it! Did you expect more? What happens when you're connected? When you connect the StreamAlot box to the electricity, it will try to get a correct network configuration. This is done using the DHCP protocol, which should give the device a correct network address and settings within a few seconds. If there is no DHCP server available in the network, the device will scan the network and try to detect the correct settings. This can take up to 5 minutes. In any case, when the device has a network address, a voice will read the address. 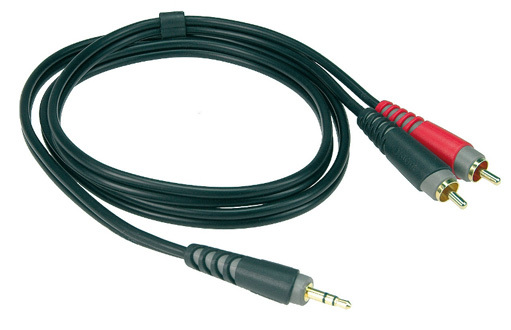 If you don’t hear any voice on your speakers, please connect headphones to the front mini jack (3), to make sure the problem is not in the audio system. If the configuration is successful, the music will start playing after the network address is heard. To install the StreamAlot box, you must first mute the volume on the amplifier, and disconnect any old music systems. Then you can connect the StreamAlot box to the amplifier. 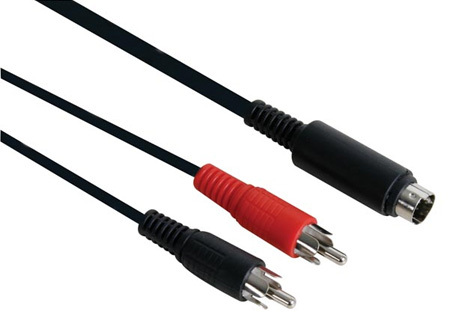 In most cases you will have to connect the StreamAlot box to the amplifier through an RCA to RCA (AKA phono or cinch) connector. Occasionally you will run into an amplifier that does not offer an RCA input. 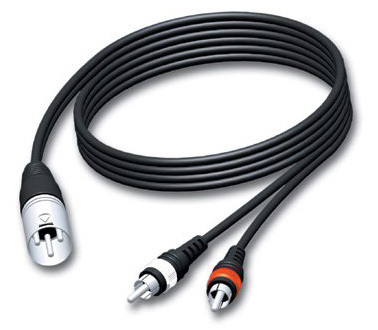 Usually when this happens, you will need an RCA to XLR, or an RCA to DIN connector. In the situation that you need to swap a computer for the StreamAlot box, you will usually find a setup that makes use of a mini-jack connection. In that case, you can use an RCA to mini-jack, or in case you cannot reach the connection (i.e. when built in) you need to use an in-between Female mini jack to RCA extender. The latter is not advised, as adding another point of failure could possibly lead to loss of audio quality. Always advise someone from the location where you are making volume adjustments! New StreamAlot boxes have a default volume level of 85%. On computer systems, this level is lower, as it can be with a StreamAlot swap (before with DIMP the volume would be typically set to 45%). This means the volume level will be higher after connecting the new StreamAlot box! Before you connect the StreamAlot box, you should test this on the network to check whether the stream is actually working. This prevents having to replace everything in case the fault lies in the box. On most locations it won’t be hard to adjust the volume to the right level. Larger locations will have more than one amplifier, multiple spaces and/or microphones connected to each other. When an existing sound system is replaced by the StreamAlot box with a louder volume output, obviously this should be adjusted to fit the setup. It’s really important to never adjust the Master Volume, as this also typically changes the volume settings for all other audio systems, such as the microphone, different zones, etc. You should only adjust the volume for the music channel. 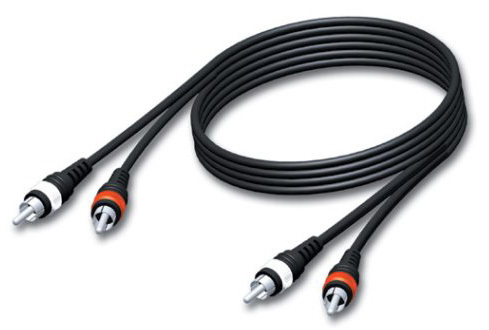 If you encounter a previous sound system, just follow the cables and try to find out to what amplifier it is connected. This way it’s usually pretty easy to figure out through which amplifier the audio channel is being transmitted. When changing cables, make sure to correctly label these with stickers. This prohibits future mixups of cables and makes it easier for other people to make adjustments later on. PS. Some locations mark of the volume levels with a marker. In case you make an adjustment to the volume levels, make sure to remark the new settings. 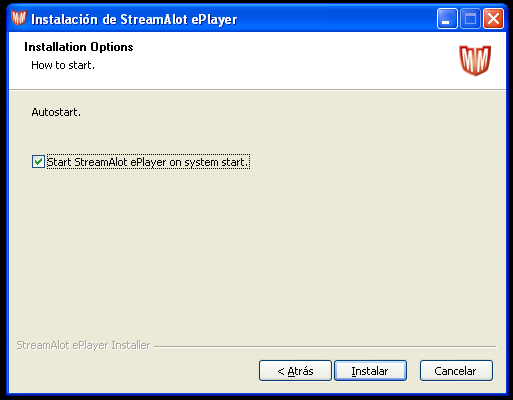 The StreamAlot ePlayer is a software music player. Without the need of any additional hardware device, you can access the StreamAlot music channels using your own PC. NOTE: You must have administrator privileges on your PC in order to follow the steps below. If you don’t, please contact your system administrator. You can mark this checkbox if you want the ePlayer to start automatically on system startup. Type in your ePlayer credentials and press Ok. If the login information was correct, you will see the following screen, and after a few seconds the music will start playing. The ePlayer will play music non-stop. If you need to pause the music, you can click the pause button in the ePlayer and the music will stop. The pause button will change into a play button. When you click this button again the music will automatically restart. NOTE: Because you are listening to a live channel, the music will continue playing while your player is paused. So, when you click on the play-button again, it is possible that you will hear a different song than before you paused the music. This depends on how long the music was paused. To change the playing channel, simpy click on the desired channel name. The ePlayer will connect to the new channel without disconnecting the current one, providing a crossfaded switch between the two channels. You can schedule which channel should play at any time and day of the week. This must be done via the StreamAlot website. For more information about how to use the calendar, refer to the corresponding section of the manual. If you would like to change the ePlayer password, you can do so easily from the player. 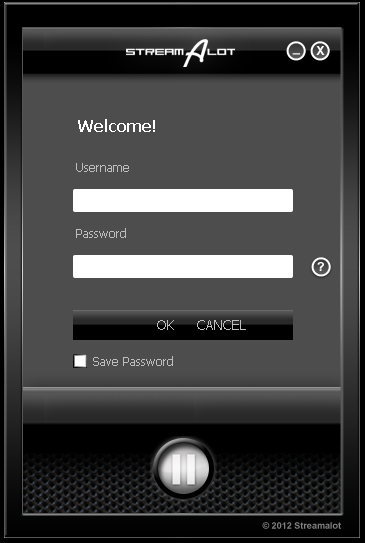 Right-click on the player background and select the change password option. Type in your current password, and the new password twice to avoid mistakes, and press save. Your password will be changed, and the next time you use the ePlayer, you will have to use the new password to login. Not working? Followed the installation guide and still can’t hear the music? No worries. Usually, all problems with playback come down to one of three issues stated below. Make sure your StreamAlot box is powered on. If the LED’s on the front of the StreamAlot box don’t light up at all, it is not receiving any power. Make sure you are properly connected to the Internet. If the lights on your StreamAlot box keep cycling repetetively, it is not connected to the internet. Make sure your Internet device (modem, router) has an available port. Make sure that the problem doesn’t lie with your audio system. Check this by connecting a regular pair of headphones with a mini-jack connection to the front input on the StreamAlot box. If you hear music through the headphones, please check if the amplifier is turned on and check whether it’s set to the correct input and volume. If you still can’t hear any music please contact The Music Marketeers or a local TMM/StreamAlot partner. If you're sure your setup meets the basic requirements but still don’t get any music playback, you should read the StreamAlot box and connection section of our FAQ or follow the steps below. Use DHCP in your network. Normally, DSL providers can activate the DHCP server in your DSL router. If this option is not possible, configure the network settings manually. It is very simple to configure the streaming box, and will take you less than 5 minutes! Please follow the manual setup steps found here. StreamAlot is the streaming audio platform from The Music Marketeers. TMM is a leading world-wide company that offers instore entertainment (backgroundmusic, narrowcasting and Disney Instore Kids TV) to thousands of locations, all over the world. Find out more about us by visiting our website. I’m interested in the StreamAlot services, but want more details. Please contact your local or areal office of StreamAlot. They wil gladly help you out! StreamAlot works on a rental basis, so there are no costs for buying the StreamAlot box. You only pay a montly fee, which depends on your number of locations. Please visit the website, or contact your local or areal office of StreamAlot for more information. The only additional costs are the public performance fees, that any location where music is played needs to pay. What are the public performance fees and how much do they cost? The public performance fee is the cost that needs to be paid by the owner of the location where the audio and/or video is played. This fee is paid direct to organizations like ZAIKS, ZPAV and the SENA/BUMA. The Music Marketeers cannot mediate in the public performance payment procedure; Public Performance fees are calculated differently in every country. Sometimes it depends on the size of locations, sometimes on the number of speakers, number of seats/tables etc. The Music Marketeers also provides Royalty Free music. The license for this music only has to be paid to The Music Marketeers and explicitely not by yourself to public performance organisations. Please note that Royalty Free music, although of high quality, does not contain famous tracks and the music may never be mixed with commercial repertoire. The advantage on the other side is clear: a location will save serious payments for public performance fees. Unless agreed upon otherwise, the contract is signed for a duration of three years. How can I be sure that the system is 100% legal? The Music Marketeers has signed an agreement with ZAIKS and ZPAV (STEMRA and NVPI) for each location and pays all required copyright and producer fees, so the license for the music is provided from the moment the system is installed. I have a question about the invoice I have received. Who can I contact? Please contact The Music Marketeers or your local TMM/StreamAlot Partner for more information. You can also send an email to info@streamalot.eu. Do you also offer Audio Solutions? Audio solutions are not included in StreamAlot. 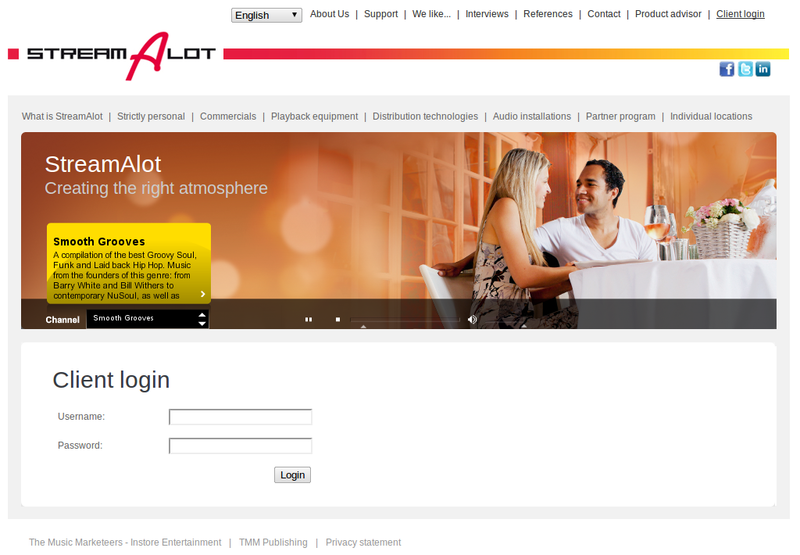 StreamAlot is developed and serviced by The Music Marketeers, pioneer in in-store entertainment. Our experience shows that an optimized audio setup is a necessary precondition to maximize the effectiveness of instore music. TMM brings hands-on experience in developing and implementing audio solutions to the table; solutions that are specifically tailored to the location’s acoustical anomalies, and are as effective as they are cost-efficient. Please contact The Music Marketeers for additional information. The Music Marketeers offers a wide selection of quality brands. Although we are a certified Bose ProPartner, we are fully independent and always operate with your interests at heart. By supplementing our streaming solutions with our audio services, you effectively opt for a one stop shop package. If hassle free music is important to you, The Music Marketeers delivers. My StreamAlot box doesn’t play any music and no LED's on the StreamAlot box are lit. When there are no LEDS lit on the StreamAlot box, the box isn’t getting any power. Please check if the power cable is plugged in correctly. In case the LED’s on the StreamAlot box still don’t light up after you checked your power supply and plugged in the power cable again, contact StreamAlot for support. My StreamAlot box doesn’t play any music and only the green LED is lit. What can I do? When only the green LED is lit, it means that the StreamAlot box is receiving music via the stream correctly. Please plug in the headphones in the front of the StreamAlot box via mini-jack plug. If you hear music playing through the headphones, the problem is probably in your music system. Please check if the amplifier is turned on and check if it’s set to the correct input and volume. My StreamAlot box doesn’t play any music and both the green and red LED’s are lit. If both the green and red LED are lit, it means the box can’t connect to our StreamAlot streaming platform. Please check if both sides of the network cable are connected correctly. If the network connector (on the back side of the box) has no LED’s lit, the network cable could be broken or the network cable not connected correctly. If the hardware is connected correctly, please follow our setup guide to setup the Internet settings manually. The music is interrupted constantly. The StreamAlot stream constantly uses 64kbps of bandwidth, which is less than 10% of a 1Mbps DSL connection. Although the streaming box has a buffer to avoid music interruptions during short peaks of high use of the connection, music interruptions can happen, but only when the internet connection is constantly highly used. I can’t switch channel but I can hear music playing. What can I do? If you can’t switch channels, the StreamAlot box is playing to music from the fall back USB stick and not through the live music stream. This problem occurs when the StreamAlot box isn’t able to connect to the internet. Your network cable could be broken or not connected correctly, or there could be a problem with your Internet provider. What is the USB connector for? StreamAlot can provide a USB device as a failback, for those cases that the Internet connection can fail. Please contact StreamAlot for more details. When you are sure all the aforementioned issues have been resolved, and still can’t play any music, please contact our experienced staff.